Italian has both regular and irregular verbs. Regular verbs are easy to conjugate. There are 3 types, named after the ending of a verb's infinitive form (shown in any dictionary): "-are", "-ere", "-ire". 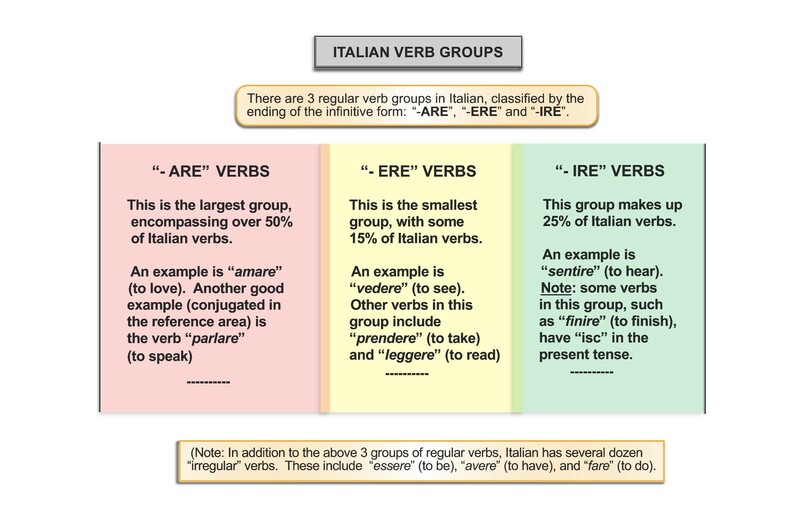 The largest group is "-are" verbs. Each of the 3 verb groups follows its own conjugation rules. The good news is that once you learn (memorize) the pattern for one "-are", "-ere" or "-ire" verb, you own the recipe for thousands of its sister verbs! "iamo" in the first person plural. So, anytime someone mentions that "I am doing something", you'll hear the stem + "o" sound (studio = I am studying; leggo = I am reading; guardo = "I watch"). Similarly, anytime you hear the "iamo" sound (studiamo = we are studying; leggiamo = we are reading; guardiamo = we watch), your brain should automatically sense that "we" are doing something or "let's" do something.